Halloween is one of my favorite holidays. I love all the decorations for it, it's fun to dress up and, of course, the treats! Well all of that fun can lead to a lot of waste if you aren't paying attention. So I am going to offer you some suggestions on how to have a goulish time on Halloween without creating a lot of waste. 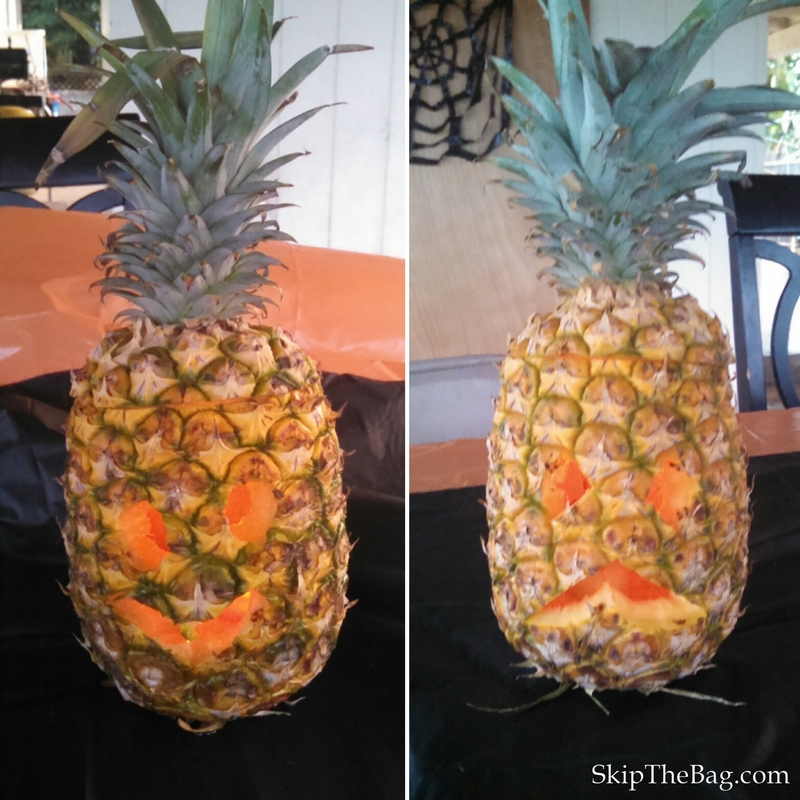 Use pumpkins, gourds or even pineapples for decoration. Using edible food can serve as double duty. You can roast pumpkin seeds or eat the pineapple, then when Halloween is over, they can go in the compost. Use branches and leaves from the garden. Halloween is smack dab in the middle of fall, one of the best seasons for using nature's decorations. 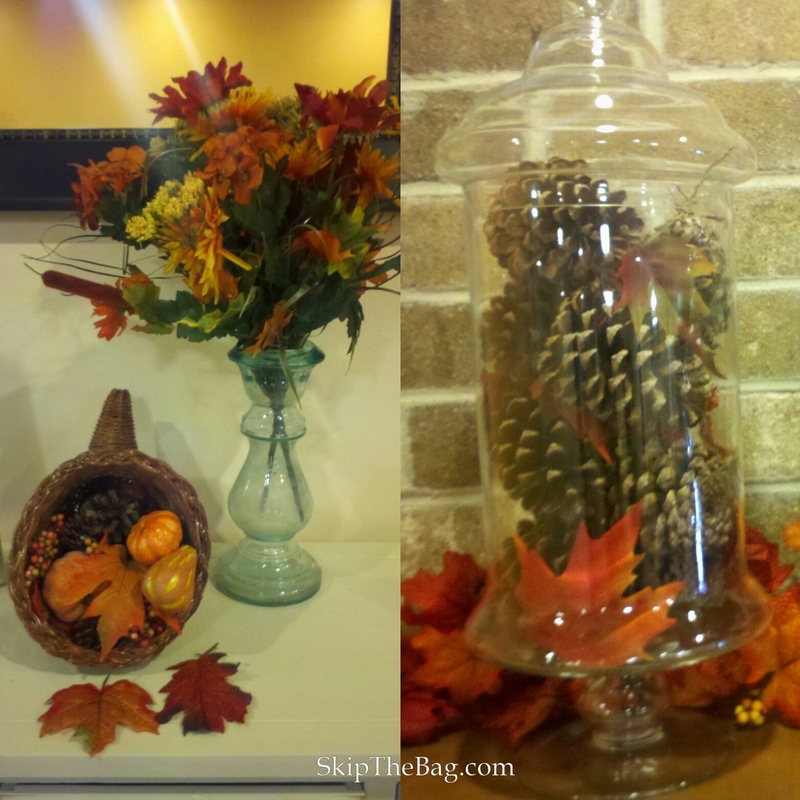 Some sticks, leaves or pinecones may be all you need. Use hay bales for decoration and then use them to mulch your garden. Buy sturdy items that can be reused or have another purpose. I found an old candlestick at a thrift store and will be able to use it for years. I'm tempted to paint it black, but it still fits the theme with its old patina metal look. Reuse decor from other holidays. 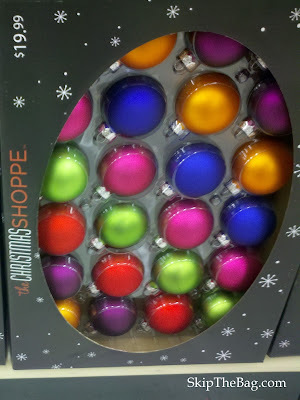 The purple, orange and green balls from these Christmas ornaments would work great for Halloween. Organize a costume swap. There are many resources for organizing clothing swaps. One way is to have each person who donates a costume gets a ticket and that ticket can be exchanged for a new costume. If you want the swap could then be opened up to other non-donators and used as a fundraiser. I could see this working best where there were a large number of kids with different ages, like an elementary school or church group. Buy from a second hand store. During October many Goodwill stores actually sell new costumes. That is a less expensive option than purchasing new, but I'm talking about making your own costume! There are a near unlimited number of costumes that could be made or repurposed from a second hand store into a fantastic costume. Some ideas: Ninja (all black), Where's Waldo (red striped shirt, jeans), and a referee (black striped shirt, black pants, black hat, whistle). Remake from what you have at the house. Go as a ocean gyre. Attach plastic bags, empty plastic containers and other clean debris to a neutral outfit. You will be using what you already have and helping to spread awareness. Be a present. Cut holes into an old cardboard box and put a big bow on your head. Be a robot. Again, using an old cardboard box or two for the body and head. Ask around at local stores if you can go through their dumpster to find large enough boxes. Wear an old prom dress add some gloves and a tiara to be a princess. Upcycle an old costume. Last Halloween Hubby bought a purple suit so he could go as the Joker. Well I am going to try and get as much wear from that suit as I can! Some ideas I've had are to go as a dia de los muertos guy, Jim Carey from the Mask, the Joker again, a zoot suit. 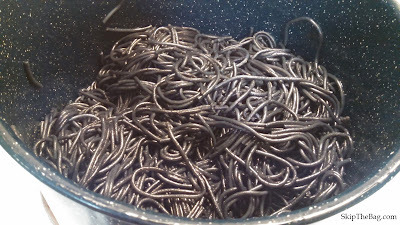 There are numerous reasons why people might want to avoid candy for Halloween. Some do it for health reasons and others for environmental reasons (those mini candy bars make a lot of trash!). I recently found out about Books For Treats a non-profit that was started to give gently read children's books rather than candy out at Halloween. So that got me thinking about some other non-candy alternatives that could be given out. Obviously the cost of these alternatives will vary depending on the number of trick-or-treaters that come to your house. If you do end up with a lot of excess candy some dentist offices participate in a candy buy back program. It looks like children donate their candy and then it is shipped to oversees military members. Books For Treats I love the idea of giving children's books! A tip is to pick up the used books at yard sales (or raid your children) so you have them for Halloween. Pencils: The dollar store often has Halloween themed ones! Cards: You could give away playing cards or I read somewhere someone had a deck of 52 Fun Things to do in the Car* with kids and gave away individual cards. Although you could make your own cards* with your own ideas or with local events. Fruit such as mandarins- These are extra cute if you draw jack-o-lantern faces on the peel. 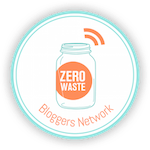 Kathryn at Going Zero Waste has some other great ideas for Halloween inspired food. I will probably write an entire post on this in the future, but here is the gist: use 'real' dishes and silverware and avoid plastic and disposables. Worried about having to do too many dishes? Ask for help, or use biodegradable or compost friendly disposable alternatives. Worried your metal forks aren't as festive as the plastic orange ones? Put them in a mason jar with some orange and black ribbon. 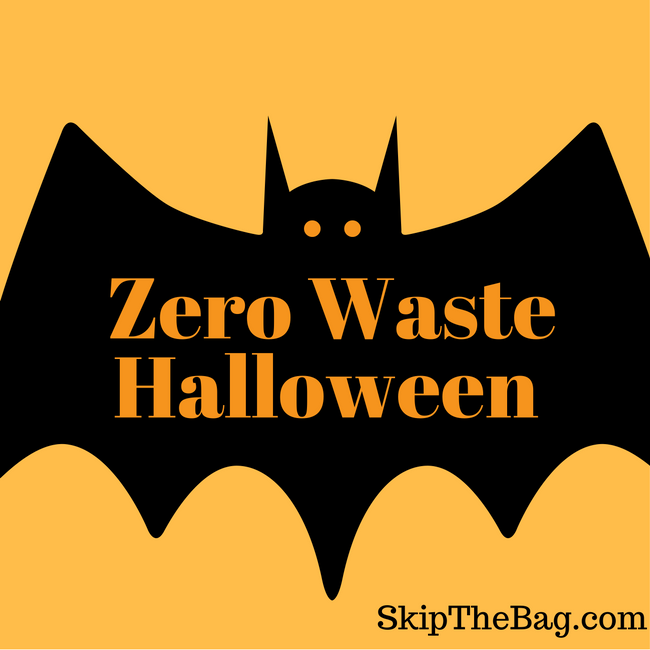 What do you do to minimize waste while celebrating Halloween? Completely love this! Halloween is my favorite by far! We do carve pumpkins but soon go to the chickens after. I LOVE these alternatives to candy since my boys can not eat traditional candy. I do wish more people would hand out alternatives for those with allergies (or at least have an optional item!). The "switch witch" sure has lots of new ideas this year! Thank you! Thank you! I think it would be fun to give some of these items at Halloween rather than candy. Oh my goodness, this is jammed back with ideas! I love the watermelon brain and the idea for a costume swap. And you give tons of ideas to give out other than candy. Food allergies are becoming a bigger and bigger deal, so it's always good to have alternatives. Thanks for sharing! I didn't think about food allergies, but it is another great reason to avoid food! 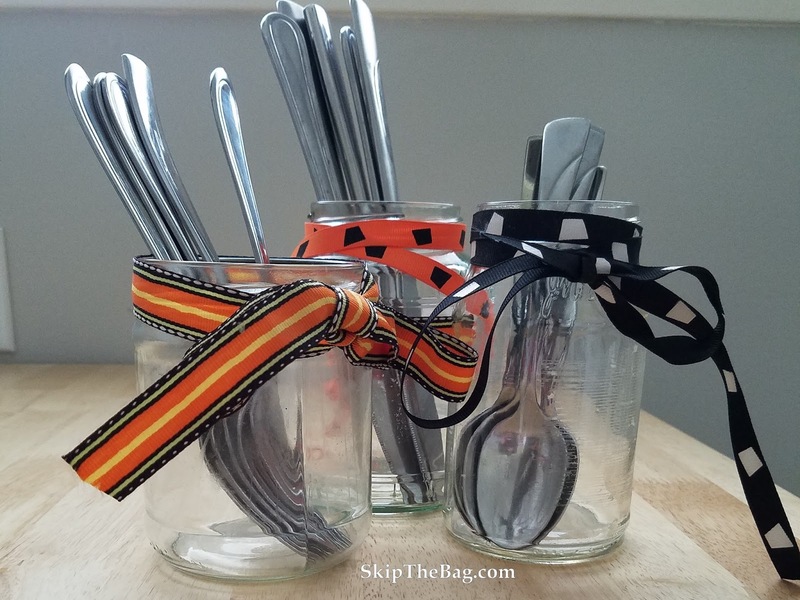 Thanks for sharing these great ideas for a greener, less wasteful Halloween. I'm featuring it on this week's Simply Natural Saturdays. Thanks for linking up! Great ideas here for a party and I am getting ready for one soon so I can definitely use them. Love that back spaghetti. Thanks! It was a lot of fun. This year we're having a bigger crowd so I'm sticking to finger food so I don't have as many dishes to do.